The High Life Update gives you the chance to live large in Los Santos with the ability to own two properties at any one time and the addition of five opulent new apartments. Add to your real estate portfolio with hot new listings at Eclipse Towers in Vinewood, Richards Majestic in Rockford Hills, Tinsel Towers in Little Seoul, 4 Integrity Way in Downtown, and Del Perro Heights by the beach. As always, just drive up to the new property location sale and follow the prompts or head to Dynasty8realestate.com to look for your next purchase. Now that you can store vehicles across two apartment garages, you’ll be looking to put something new and shiny in them and The High Life Update offers a trio of luxury cars and a blistering new motorbike to add to your collection. The Enus Huntley S (SUV), Dewbauchee Massacro (Sports), Pegassi Zentorno (Super) and Dinka Thrust (Motorcycle) are all now available to purchase from Legendary Motorsport. Remember, these vehicles can also be accessed from any garage in Story Mode, adding a new spin to your mission replays. And because success breeds jealousy, the powerful Bullpup Rifle is now available in Ammu-Nation to help you protect your assets. Gear up with the all-new vehicles and weaponry to take on brand new Rockstar-created Jobs in GTA Online, including 8 new Contact missions. These new Jobs will be available to play later today and stay tuned as there are even more being published soon including Capture, Survival, TDM and Last Team Standing mode Jobs. High Life also introduces many new game features and enhancements including some updates directly based on feedback from you, the GTA Online community (remember to send your feedback to [email protected] where they’re always reviewing your input for consideration). 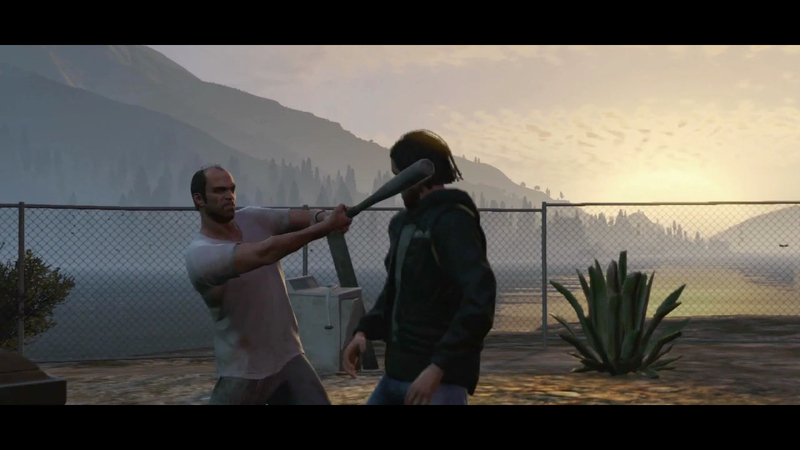 With the new Mental State stat, Rockstar is keeping track of your behavior. If you seem to enjoy attacking pedestrians and terrorizing other players, then your blip will start to turn red on other players’ maps. The redder the blip, the more psychotic the player; the whiter the blip, the friendlier they are. The actions you take will have varying effects on your Mental State. For example, killing another player will turn your blip red faster than blowing up a car or taking out a random pedestrian. Killing a player with a white blip will push your Mental State into the red faster than killing more psycho players, while taking out full-on psycho players won’t cause your own Mental State stat to increase at all. Mental state also factors into matchmaking - you’ll automatically join Freemode sessions containing people more ‘compatible’ with your play style, and if a red-blipped lunatic does enter your session, you at least have fair warning! Non-Contact Races are now an option. When you create a Non-Contact race, other racers appear as semi-transparent and collisions with them are disabled (although you'll still be able to collide with non-player traffic, structures and other scenery). You now have the option to Friend Spectate – if you and a friend are in separate GTA Online sessions you can now choose to spectate that player through the Friends menu. New player toasts and celebrations: Switch out your salute for jazz hands, a face palm, a slow clap and more. There are also paired toasts for celebrating with a friend, like a backslap, or a solid, manly handshake. New clothing: It can be hard work finding the perfect ensemble to really make your character stand out, so we’ve done some of the hard work for you and put together some stylish outfits. Hit the town, dressed to the nines with an array of classy new suit sets available with a pret-a-porter jacket, trousers, suit vest and shoes. Based on feedback from the stunting community, the changes to bike physics in a recent Title Update have been reverted. For the full list of fixes, you can view Title Update notes at the Rockstar Support site. Stay tuned for details about the High Life Weekend Social Club Event (starting this Friday, with in-game bonuses, a special Rockstar-hosted live stream, rare gear sweepstakes and more!) and join the chat in the forums! The High Life Update Now Available - Time to shut up and give your money away. 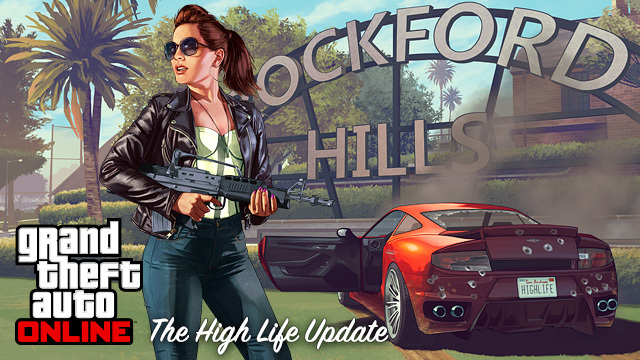 The High Life Update is now available.